Wow! This quilt simply stunning. 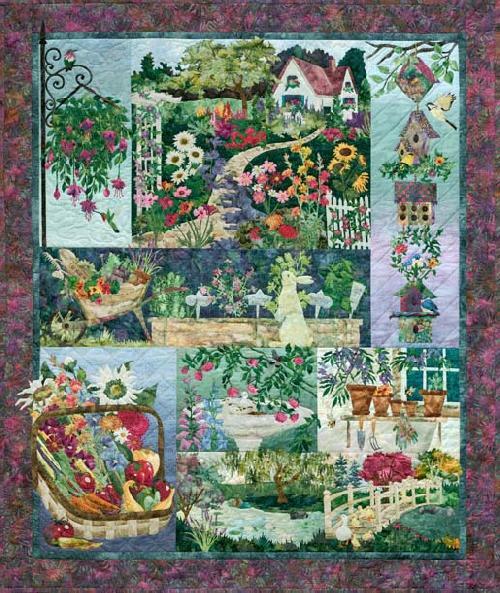 Bella Garden features not only a beautiful display of garden flowers and creatures but the most wonderful array of colourful fabrics with many designed by McKenna especially for this project. The completed quilt measures 69" x 76". 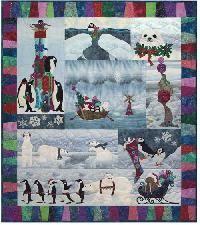 As a block of the month this quilt is completed over a period of seven months. The cost of $ 67.95 per month includes the pattern, exact fabrics and the Registered post. Revisiting the scene of the hugely popular design Storybook Farm, McKenna has taken us on a journey to meet all the characters we would love to see on a farm. With their cheeky and engaging personalities clearly shown we can only imagine how much fun they are all having. 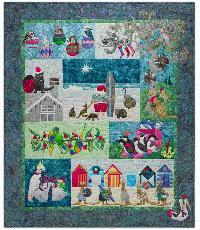 Our Block of the Month cost includes the pattern, exact fabrics and the Registered post within Australia. The completed design measures 71 1/2" x 61 1/2". This project is completed over a period of nine months. 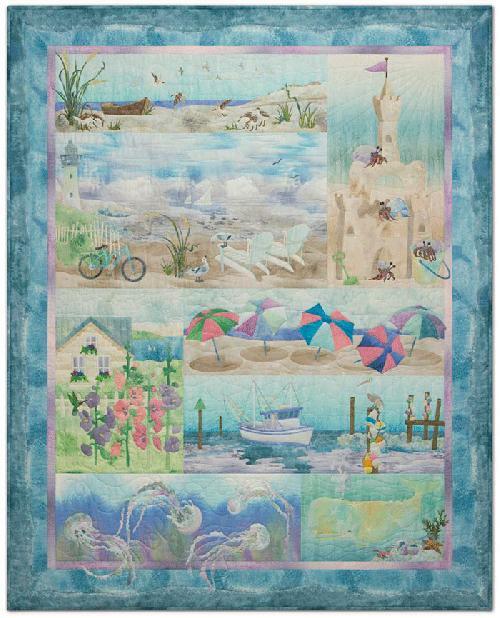 The serenity and the beauty of the beach is shown in this most recent design by McKenna Ryan. 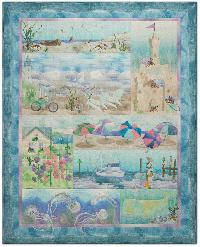 The specially designed fabrics for this quilt are just beautiful and enhance the tranquil seaside. This design is completed over a period of nine months and each month this cost includes the pattern, fabrics (exact designs) and the Registered Post. 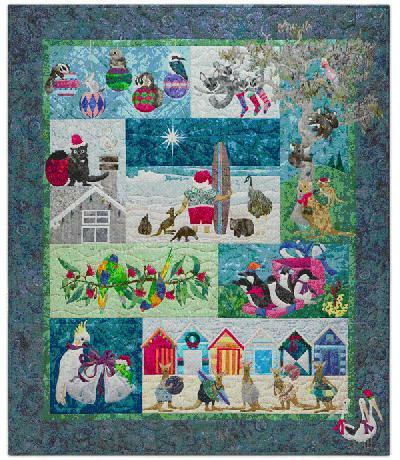 The completed quilt size is 59" x 73"
Christmas is a wonderful fun time and McKenna has captured a Down Under Christmas with our many animals and birds in such a colourful way. 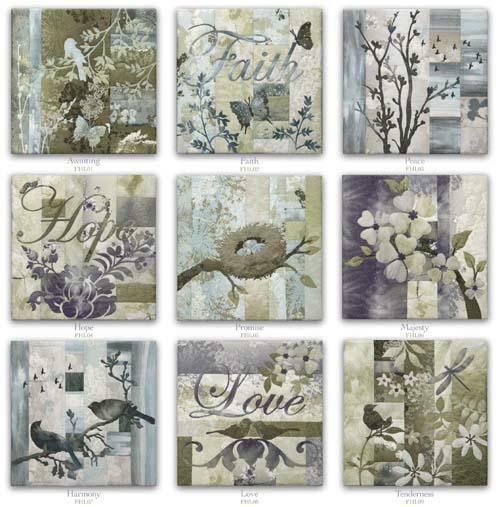 These beautiful designs are created using a colourful range of Hoffman Batik fabrics. This design is completed over a period of nine months and each month this cost includes the pattern, fabrics (exact designs) and the Registered Post. 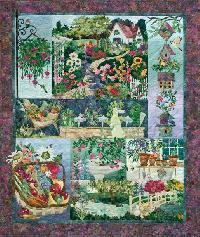 The completed quilt size is 55" x 64"
Featuring fabrics by Nancy Rink from her Pointe Pleasant range, this beautiful quilt is completed over a period of 9 months and measures approx 100" x 100". The block of the the month cost includes the exact fabrics (For quilt top including borders and binding), patterns and postage. Once again McKenna designed fabrics especially for the project. The subtle colours and easy lines of the designs are just so appealing, and completed would be a masterpiece for any home. A number of different word options are also available for download. 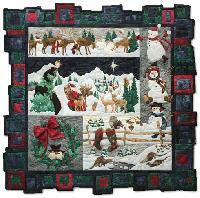 The Block of the Month cost includes the pattern, fabrics (exact designs) and the Registered post within Australia. Each completed design measures 18" x 18". This project is completed over a period of nine months. 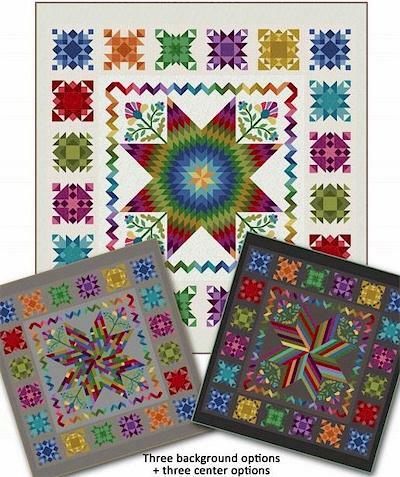 McKenna has re-released the beautiful designs from the original project with just a couple of alterations in the actual blocks. Along with this they are now completed using a beautiful array of batik fabrics. Each block measures 18" x 18". Each month the cost includes the pattern, fabrics ( exact designs shown) and the Registered post within Australia. This project is completed over a period of nine months. 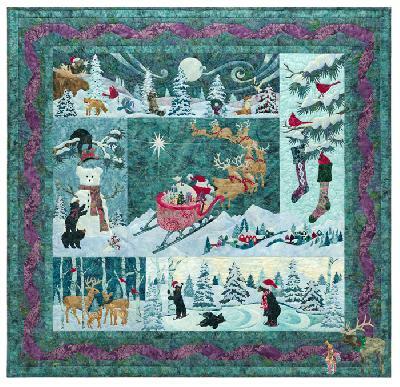 This beautiful Christmas quilt is such a delight with the many animals and scenes depicted using a variety of the Hoffman Batik fabrics. Featuring the raw-edge applique technique for which McKenna is so famous it is quite achievable for quilters of all levels. The Block of the Month cost includes the pattern, fabrics (exact designs) and the Registered Post within Australia. The completed design measures 60" x 58". This project is completed over a period of eight months. 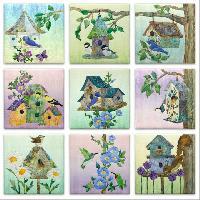 Birdhouses are one of the most popular designs of alltime. McKenna has once again fulfilled all our dreams and wishes for a new design. This design as a Block of the Month, is completed over a period of nine months. The cost per month includes the pattern, fabrics (exact designs), individual embellishment pack and the Registered Post. The fabrics required for the sashings, borders and binding are included and shall accompany the final block. 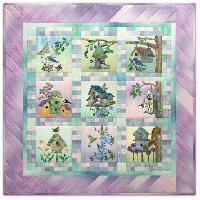 The completed quilt measures 42 1/2" x 42 1/2"
Birdhouses are one of the most popular designs of alltime. McKenna has once again fulfilled all our dreams and wishes for a new design. Each of the nine designs measures 14" x 14" and can be completed to stretch over a frame or alternately as a quilt. 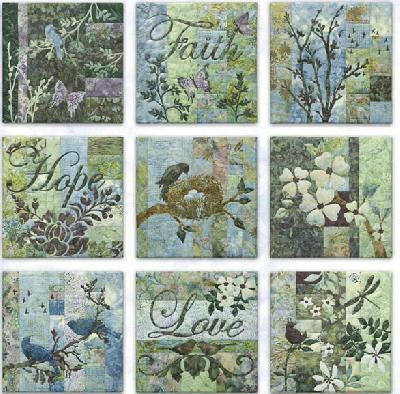 The cost of each block includes the pattern, fabrics (exact designs),individual embellishment pack and the Registered Post. 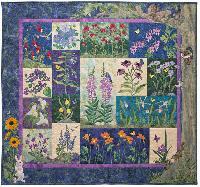 Featuring fabrics by Nancy Rink from her Getting to know Hue range, this beautiful quilt is completed over a period of 12 months and measures approx 96" x 102". The applique designs are supplied as laser cut kits for ease of completion. 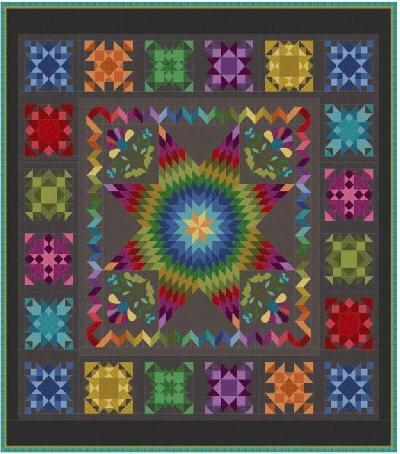 The background fabric supplied in this quilt is dark grey. 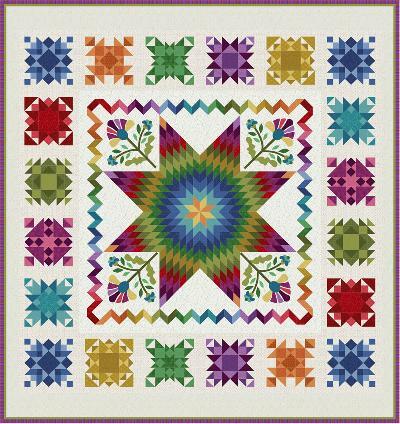 The block of the the month cost includes the exact fabrics (For quilt top including borders and binding), patterns and postage. 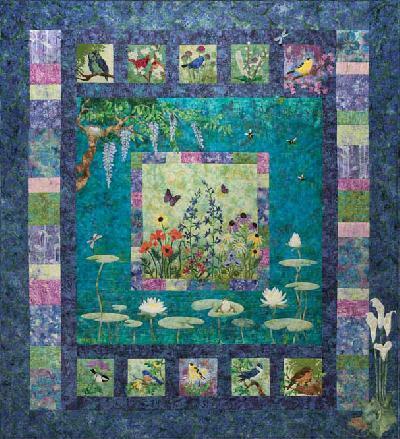 Featuring fabrics by Nancy Rink from her Getting to know Hue range, this beautiful quilt is completed over a period of 12 months and measures approx 96" x 102". 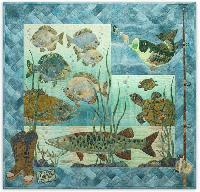 The applique designs are supplied as laser cut kits for ease of completion. 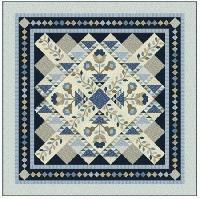 The background fabric supplied in this quilt is off white with pale grey design. The block of the the month cost includes the exact fabrics (For quilt top including borders and binding), patterns and postage. 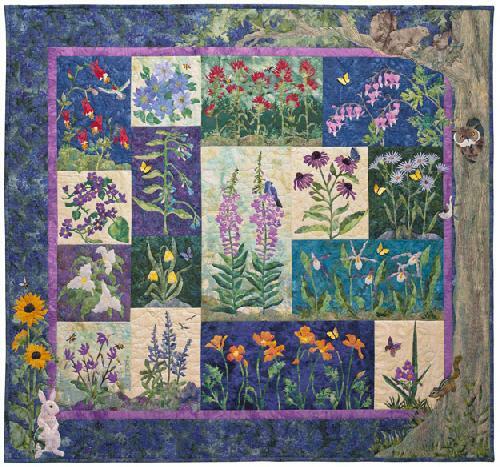 Featuring fabrics by Nancy Rink from her Getting to know Hue range, this beautiful quilt is completed over a period of 12 months and measures approx 96" x 102". 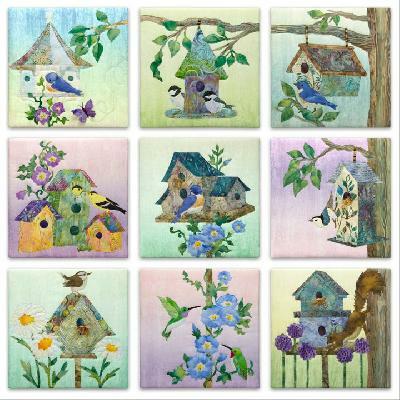 The applique designs are supplied as laser cut kits for ease of completion. 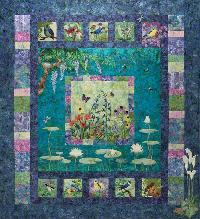 The background fabric supplied in this quilt is medium grey. The block of the the month cost includes the exact fabrics (For quilt top including borders and binding), patterns and postage. In Full Bloom is the most colourful of McKennas floral designs, featuring a wide range of Hoffman Batik fabrics. Whilst this quilt is quite a challenge, the completed design is absolutely stunning. 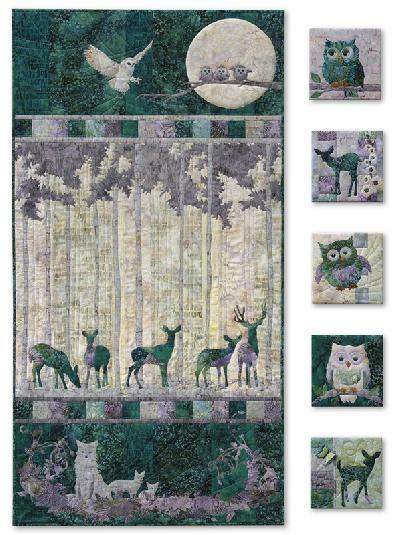 The block of the month program is completed over a period of eight months and the cost each month includes the pattern, exact fabrics and the Registered Post. The completed design is 51" x 59". This beautiful quilt and five panels are completed using a beautiful palette of subtle colours in Hoffman Batik fabrics designed by McKenna. 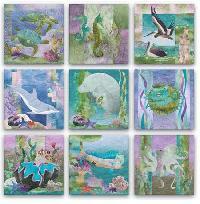 The quilt measures 30 1/2" x 57 1/4" and each panel measures 8" x 8" completed or 14" square before mounted on frames. 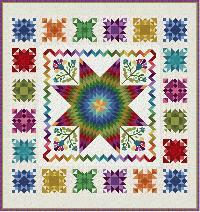 The block of the month cost includes the pattern, exact fabrics and the Registered post. Another beautiful Christmas design abounds. 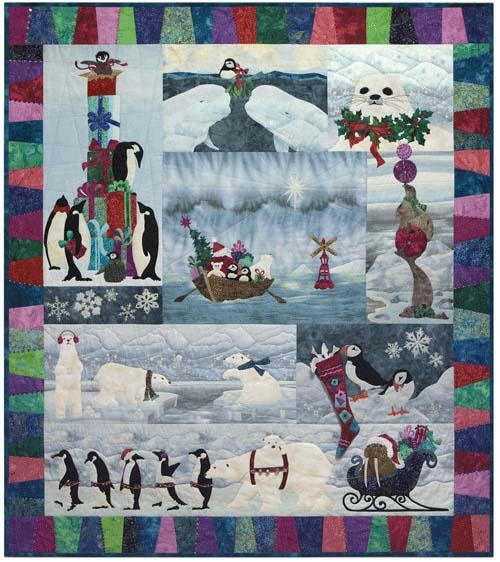 Featuring eight blocks including penguins, polar bears, whales, seals, a walrus and a parade of beautiful fabrics to enhance and engage. The colours and designs of the background fabrics offer a perfect setting for all the bright and specific fabrics used for the animals and objects. 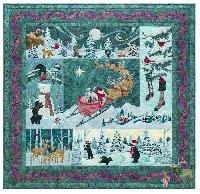 The Block of the Month cost includes the pattern, fabrics (exact designs) and the Registered post within Australia. The completed design measures 58" x 65". A re-visited design with extra happenings. 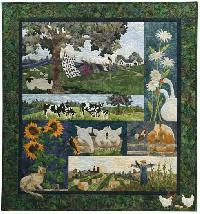 This beautiful quilt features sixteen different floral blocks plus a number of creatures appliqued on the outer border. A stunning array of colourful fabrics have been used once again to enhance each block. The completed quilt measures 56" x 51 1/2". As a block of the month this quilt is completed over a period of six months. The cost of $ 67.95 per month includes the pattern, exact fabrics and the Registered post. 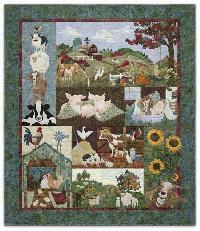 McKennas original farmyard design which is still as popular today as it was when it was first released. 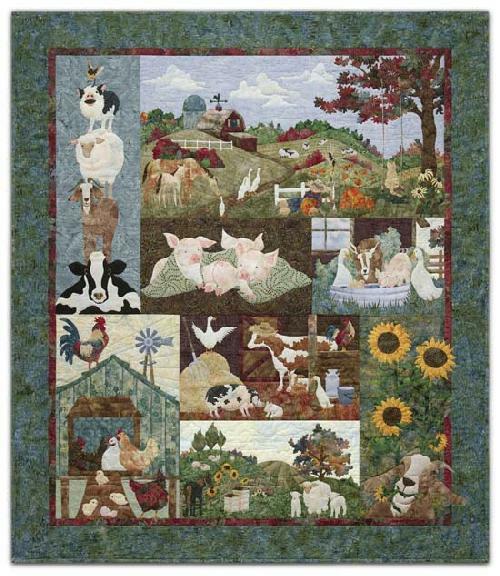 Featuring a menagerie of farm animals and beautifully depicted scenes created using the raw-edge applique technique, it is such fun to complete. 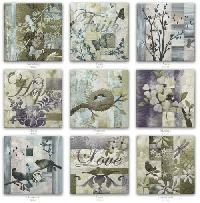 The Block of the Month cost includes the pattern, fabrics (exact designs) and the Registered post within Australia. The completed design measures 52" x 56". This design is completed over a period of eight months. 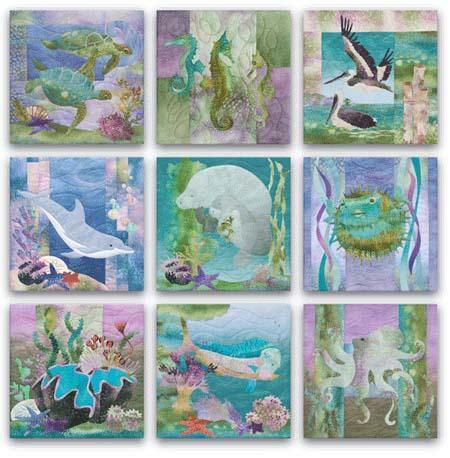 Simply stunning fabrics bring these adorable sea dwellers to life. 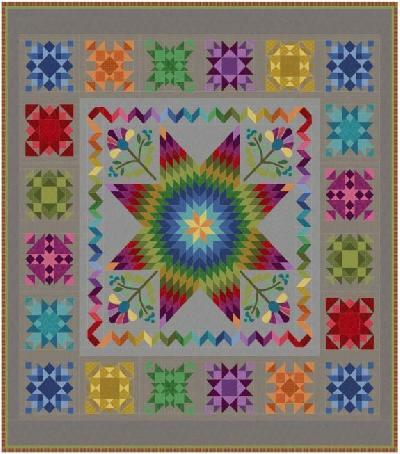 McKenna has once again created fabric and block designs which are both engaging and ever so appealing to so many of us. 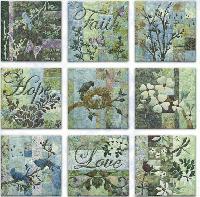 Each completed block measures 18" x 18" and can be mounted on a frame or made into a quilt. 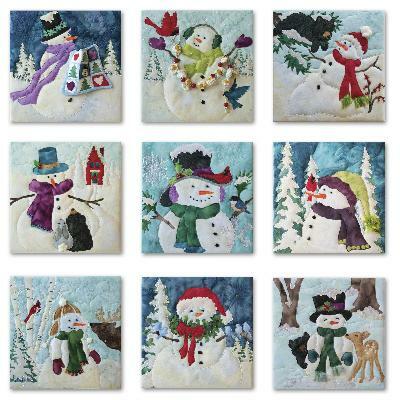 The Block of the Month cost includes the pattern, fabrics (exact designs), an individual embellishment pack containing beads, sequins, glass treasures etc. and the Registered post. A fantastic quilt with a more masculine appeal. Featuring a variety of fish and finished with an attractive braided border this quilt features many fabrics designed by McKenna herself. The completed design measures 44" x 42". As a block of the month this quilt is completed over a period of five months. The cost of $ 59.95 per month includes the pattern, exact fabrics, embellishment pack and the Registered post for each parcel. 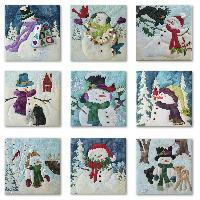 'Snow Buds' is a colourful collection of snowmen with each background measuring 14" x 14". The pattern picture depicts each design stretched over a frame. 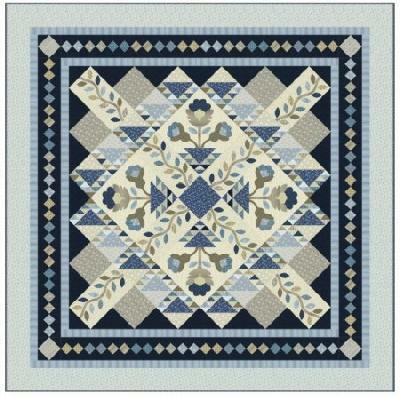 The block of the month cost includes the patterns, exact fabrics and the Registered post. 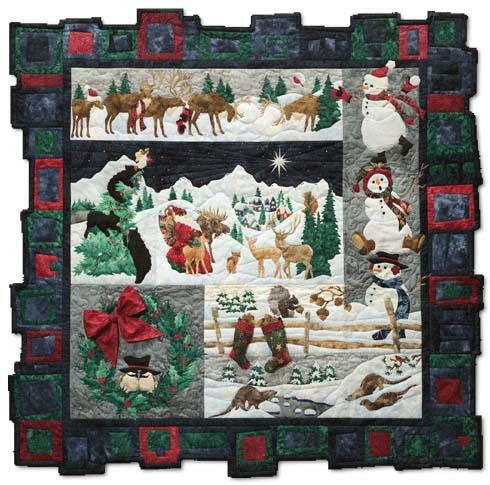 This beautiful Christmas quilt is such a delight with the many animals and scenes depicted using a variety of the handpainted fabrics. Featuring the raw-edge applique technique for which McKenna is so famous it is quite achievable for quilters of all levels. 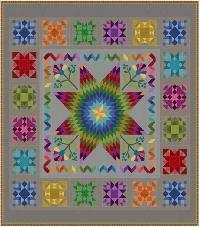 The Block of the Month cost includes the pattern, fabrics (exact designs) and the Registered Post within Australia. The completed design measures 52" x 52". This project is completed over a period of eight months.